AT least 36 people are feared to have died after a Japanese (日本的) volcano erupted without warning on 27 September, raining ash and stones on hikers, but the search for victims was abandoned after two days because of fears of toxic gases. Rescuers at the peak of Mount Ontake (御嶽山), now an eerie moonscape under a thick layer of grey ash, found five more victims of the eruption at Japan’s second-highest active volcano but authorities did not immediately confirm them as dead. The eruption of the 3,067-metre (10,062-foot) peak, 200 km (125 miles) west of Tokyo (東京), took place when the hiking site was packed with climbers, including children, admiring autumn foliage under a blue sky. Twelve people have been confirmed dead in Japan's first fatal volcanic eruption since 1991, and 63 have been injured, some with broken bones. Eight were missing, but officials said some of them could possibly be among those who perished. Japan is one of the world’s most seismically active nations. In 1991, 43 people died in a pyroclastic flow, a superheated current of gas and rock, at Mount Unzen (雲仙岳) in the southwest. 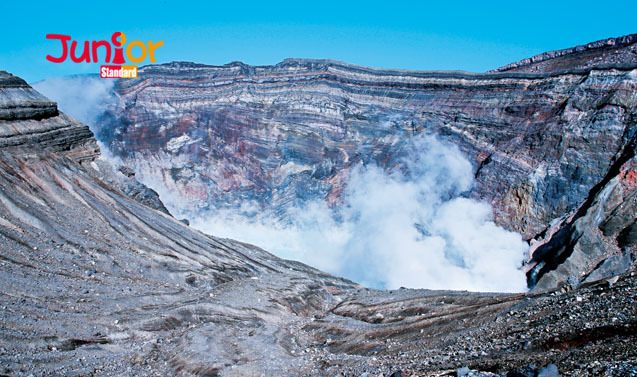 Ontake, Japan’s second-highest active volcano, last had a minor eruption seven years ago. Its last major eruption, the first on record, was in 1979.